Wind is highly unpredictable, and cannot be controlled. Human demand for electrical power is only somewhat unpredictable, and can be planned for ahead of time if humans have access to power sources that they can control -- "dispatchable" power sources -- in addition to power sources that remain on virtually all the time -- "baseload" power sources. Using these two types of power sources together, grid managers can meet a somewhat variable and unpredictable demand. But wind energy is neither dispatchable nor baseload. Wind is unpredictable and highly variable, making it a poor match for finely balanced power grids. The electrical grid is a high-wire act in which supply must be matched with demand on a minute-to-minute basis. If supply surges above demand, electrical equipment everywhere can be damaged. (That’s why you have a “surge protector” between your computer and the wall outlet.) If supply slumps below demand, brownouts and blackouts can occur. Although windmills have great energy potential, they produce electricity that is not “dispatchable.” In other words, it cannot be called at will by the operator but comes and goes as the wind blows. As wind energy becomes a larger and larger part of the electrical grid, the problem of matching supply and demand will become ever more difficult. 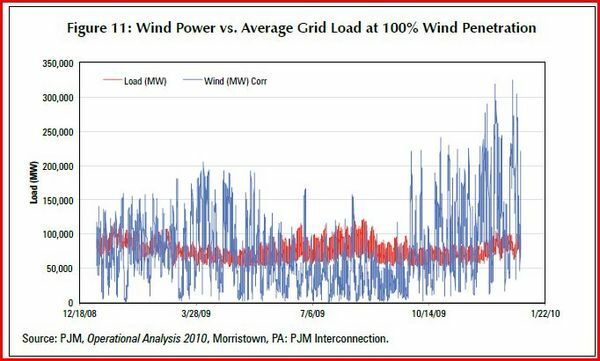 To illustrate the problem, the PJM (Pennsylvania, New Jersey, Maryland) regional grid has produced a line graph matching showing how actual demand compares with the projected output of a grid powered 100 percent by windmills. The horizontal axis represents the two factors over a period from December 18, 2008 to January 22, 2010. The red line represents grid demand, which varies between 50,000 and 100,000 megawatts (MW) on a seasonal basis. The blue line represents wind’s output over the same period. Output varies wildly, from highs of more than 300,000 MW to lows of nearly zero. It is important to remember that these are not necessarily seasonal or even daily variations. The output of a windmill can fall from full capacity to zero in a matter of hours. We feel compelled to go over these issues repeatedly, due to their immense importance to the future costs and reliability of the electrical power grid. If government policies degrade the usefulness and reliability of something so important to a society's well-being, such governments should be replaced. Are Oil Prices on the Skids? Is Russia Bankrolling Anti-Fracking Groups?